Bottom Block | Bushman Equipment, Inc.
Bushman Equipment, a manufacturer of custom-engineered material handling solutions, has delivered a special 50 ton capacity Motorized Rotating Bottom Block for a nationally known forging operation in Pennsylvania that specializes in making high length/width products with bored interiors for the surface mining industry. Bushman® motorized bottom blocks are specially designed for every application. Wire rope sheave configuration, load capacity, special control requirements and unique reeving patterns can be incorporated. 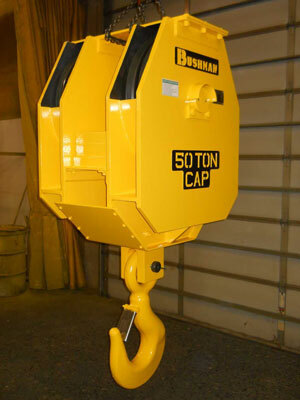 The motor driven, 360° rotating unit permits the crane operator to use an overhead crane to position heavy or awkward loads in less accessible work areas. The primary engineering challenge on the forge project was very limited headroom to operate in – about half of what is typically needed for a 50 ton block. Bushman’s engineers decided to use an eye hook and pin instead of a conventional shank hook in order to gain the necessary room in which to function. Another aid was the rearrangement of the drive motor and counterweight. The custom design resulted in a headroom dimension of just 34 inches from the center of the sheave pin to the clevis pin, whereas a conventional block would require 48” to 60”. This bottom block also required a drive motor-reducer rugged enough to withstand radiant heat from the 2000° furnace as the load is lowered into a cooling tower where it rotates continuously for 16 to 24 hours. Floor-Operated equipment includes upenders, inverters, lift tables, transfer cars and more. ReNEW inspection, repair and upgrade of all brands of material handling solutions. Founded in 1950, Bushman is located in Menomonee Falls, WI, just outside Milwaukee. We are 100% employee owned.